Stitch these 3 Inspirational Plastic Canvas Pictures for your Home or as a Lovely Gift! 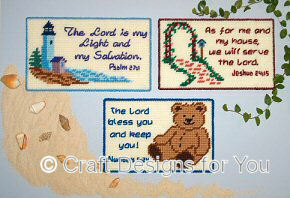 Click Here to see these designs in Cross Stitch. Patterns include high-quality, easy-to-read black and white graphs with instructions. Stitch on 7-count clear plastic canvas with 4-ply yarn. Each picture is approximately 9" wide by 6" high.